Jesus was a very common name among Jewish males in the first century. The historical evidence found in documents and inscriptions (2500+) has caused scholars to estimate that Jesus was the 4th most popular name behind Simon, Joseph, and Judah. If you grew up in first-century Palestine, odds are you would have known a boy named Jesus. But why was that name so popular? Jesus is the Greek equivalent of the Hebrew name Joshua and Joshua is the combination of two words that when put together mean, “Yahweh Saves.” So the little boys, named Jesus, who were running around the 1st century synagogues in Israel were a reminder and a hope that the God who saved Israel in the past would one day save them again, for good. But the question is, “How would God save His people?” and that’s where Jesus of Nazareth enters the discussion. Jesus of Nazareth was so-named not simply because His God would save but because He had come as God in the flesh to accomplish salvation. But what does that even mean, “God in the Flesh?” This strange and mysterious teaching of Jesus coming as God in the flesh is known as the Incarnation, an act whereby the eternal Son of God, the second Person of the Trinity, without ceasing to be what He is, took upon Himself human nature. That which is beyond all space and time, what is uncreated and eternal, came into nature, into human nature, descending into his own universe, and rose again, bringing nature up with Him. As if the Incarnation were not miracle enough, there is also something else that confronts us as we study Jesus of Nazareth and it is the fact that He was crucified, buried in a borrowed tomb and then rose again on the third day. He was dead and God resurrected Him from death. The two grand-miracles of the Christian faith are the Incarnation of Christ and the Resurrection of Christ. Jesus the infinitely holy and pure Son of God humbled Himself and became a man in order to save mankind from sin. Then in His humility, He gave up His life to atone for our sin and after being dead for 3 days He was raised from the dead and He lives today. What a staggering thought! What a mystery! Why do I call it a mystery; because that is how Paul referred to it. Listen to how Paul refers to the string of truths that make up the Christian gospel. 1 Timothy 3:16 Great indeed, we confess, is the mystery of godliness: He was manifested in the flesh, vindicated by the Spirit, seen by angels, proclaimed among the nations, believed on in the world, taken up in glory. The faith that we confess contains amazing truths, truths that have been revealed to us by God in His Word and in the person of Jesus. But these truths are not simply meant to be cataloged and placed up on the shelf, we are meant to pry into these truths with hungry hearts that we might behold the glory of God and in beholding God’s glory that we might be transformed. 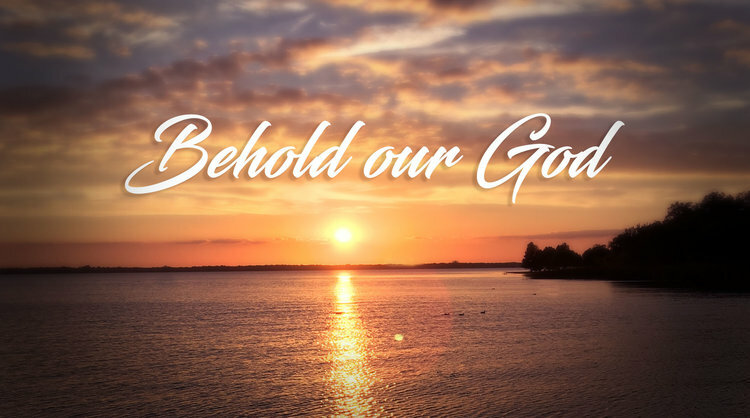 Our goal this morning is to savor the beauty of Christ as we gaze at the mystery of His incarnation and His Resurrection to learn what we can about our King. To do this, I want us to ask a series of questions and let the Scriptures fill in the gaps for us. John 1:1-4 , In the beginning, was the Word, and the Word was with God, and the Word was God. 2 He was in the beginning with God. 3 All things were made through him, and without him was not any thing made that was made. 4 In him was life, and the life was the light of men. It was not God the Father who became flesh but one who was with God in the beginning, and who was God. The one who became flesh was not part of the created order; for He is the One who made everything that has been made. In Him is contained the life and light of mankind. The Word that became flesh is the Son of God, begotten not made, who came into the world to bear witness to the truth and to reveal the grace of God more profoundly than any before Him. Colossians 1:15-17 He is the image of the invisible God, the firstborn of all creation. 16 For by him all things were created, in heaven and on earth, visible and invisible, whether thrones or dominions or rulers or authorities - all things were created through him and for him. 17 And he is before all things, and in him, all things hold together. Christ Jesus existed long before He filled that manger in Bethlehem. He was with God in the beginning and throughout Biblical History, He has been present for us to see. In Genesis, he is revealed as the seed who would crush the head of the deceiver. Also in Genesis, he is the angel of the Lord. In Daniel and the Revelation, he is referred to as the Ancient of Days. He is the bright and morning star, the Arm of the Lord, the Son of God and Son of man, the creator of all things, the sustainer of all things, the true bread, the living water, the light of the world, the only begotten son of the father, the captain of our salvation, the lamb of God, the man of sorrows…He is Emmanuel. He is called faithful and true, the last Adam, the author, and finisher of our faith, the good shepherd who lays down His life for the sheep. He is also King of kings and Lord of lords. All of these titles are given to Jesus and they set him apart as the unique and anointed Son of God who comes from the Father to bring redemption to His people. John 17:4 Father, I glorified you on earth, having accomplished the work that you gave me to do. 5 And now, Father, glorify me in your own presence with the glory that I had with you before the world existed. Jesus Christ shared in the glory of God before the world came into being. “Who is this that has been manifested in the flesh?” Jesus Christ the eternal Son of God, the second person of the Trinity. He is God in flesh. II. How did He come to us? We can answer this question in two ways: Historically and Theologically. The coming of Christ in history is revealed in the story of the virgin birth and the delivery that took place in a cattle stall in Bethlehem. He was conceived by the Holy Spirit of God to virgin mother who had never known a man. He was born into a poor family, sure to suffer in life is almost too much for us to comprehend. He came not in the majesty of a king, attended with his royal-guard, but he came poor; not like the heir of Heaven, but like one of an inferior descent. The place he was born in was poor; not the royal city of Jerusalem, but Bethlehem, a poor obscure place. He was born in an inn, and a manger was his cradle, the cobwebs his curtains, the beasts his companions; he descended of poor parents. that the human nature should not be God, yet one with God. He stripped himself of the robes of his glory, and covered himself with the rags of our humanity. This is definitely not the way you would expect the story to go for the Son of God coming into the world; but this will be one of the great themes of the Gospel. God has come to rescue the poor by becoming poor. He has come to heal the broken, the lame, the blind, and the outcast by being broken and cast out in our place. Jesus makes clear that God has a heart for the lowly and desires to make sinners into sons. But what about the theological side of the question? Within the early church and early Christian literature, Christ stands out as both human and divine, the Son of God but also the son of man. He was universally regarded as having sinless character but at the same time He was regarded as a proper object of worship. But over time difficulty arose. How could Jesus of Nazareth be both God and man? How could He possess a divine nature (eternal Logos) and a human nature (born of Mary). In time, these difficult questions led to a series of Christological controversies and the church found herself in a position of needing to articulate a clear and unified doctrine of Christ. At the Council of Chalcedon in 451 AD the church produced a statement that remains a standard to this day. This remains a mystery to us. We cannot fully conceive it but we can and do try to formulate it in words that convey our understanding of what we read in God’s Word. By the way, listen to what we read of Christ in the book of Philippians. Phil 2:6…though he was in the form of God, (he) did not count equality with God a thing to be grasped, 7 but emptied himself, by taking the form of a servant, being born in the likeness of men. 8 And being found in human form, he humbled himself by becoming obedient to the point of death, even death on a cross. Christ came into the world in an act of humility wherein the heir of Heaven became a human baby wrapped in rags. His ultimate mission was an act of incomprehensible humility wherein the Son of God obeyed the Father and laid down His life on the cross. III. Why did Christ come? 1. In Mark 10:45 Jesus tells us that “The Son of man came not to be served but to serve and to give his life as a ransom for many. 2. In Hebrews 7:25 we read that He came to save those who draw near to God. All of these passages and more tell us why Christ came into the world. He came to stand in the gap between man and God. He came to call us back from the cliffs overlooking Hell. He came to turn the world upside down in order to find his lost treasure and bring it back home to God. He came to serve as our priest and to offer the final sacrifice that would ransom us from our sinful shame. We cannot save ourselves. All of our attempts at self-salvation will fall short, but to trust in Christ by faith is to be freed from sin and saved from its curse. This is good news and this is why Christ came. If you think that your sin is too great for God’s forgiveness, think again. His grace is greater than all our sin. He came to save the worst sinners. He came to rescue those who are weak, to heal those who are sick, to redeem those who are so far from God that they never imagined a savior could reach them. He didn’t come for perfect people, He came for wretched sinners and this is great news because we all qualify. Why did Christ come? To save His people from their sin. IV. What does the coming of Christ mean for us? Col 1:19 For in him all the fullness of God was pleased to dwell, 20 and through him to reconcile to himself all things, whether on earth or in heaven, making peace by the blood of his cross. You see, whether we realize it or not we have been at war with our creator. It is a war that we were born into and as soon as we had a choice in the matter we took up arms against Him. Every sinful thought and deed has been an act of combat, but we have been fighting a war we cannot hope to win. But rather than simply destroying His enemies God has offered us peace. Jesus Christ came to put an end to the battle once and for all but instead of putting us to death for our part in the war, He chose to die in our place. Christ walked out onto the battlefield and instead of condemning his enemies He laid down His own life to make peace. But His death was not the end. Three days later, God raised Him from the dead. The resurrection shows that Jesus not only defeated death but He has overthrown it. By His Resurrection He has overcome death, so that He might make us share in the righteousness He won for us by His death…and His resurrection is a guarantee of our (own) glorious resurrection (to come). V. One last question, “So, who is Jesus Christ?” Over the last 2,000 years the church has sought to craft statements, which accurately affirm what we believe the Bible to teach concerning the person, position, and accomplishment of Christ. The guys over at Ligonier (R.C. Sproul and others) have put together a statement that they hope will serve to answer the question, “Who is Jesus Christ?” for our generation. If you are a believer then this news should fill you with joy. The gospel is not a pleasant fiction but a joy-filled reality. Jesus came and lived on this earth and did the amazing things the Bible tells us about. He really lived, He truly died and then He miraculously rose from death. He went from the cradle to the cross and from the cross to His throne and one day He will come again to dwell among His people. If you are not a believer then my hope is that this sermon would fill you with longing to experience the peace of Christ for yourself. The coming of Christ into the world shows us something that we couldn’t fully see in any other way, it shows us that God loves us even though we are sinners. I John 4:9 In this the love of God was made manifest among us, that God sent his only Son into the world, so that we might live through him. Come to Christ and live. Invitation to the Lord’s Supper. Matt 11:28 Come to me, all who labor and are heavy laden, and I will give you rest. 29 Take my yoke upon you, and learn from me, for I am gentle and lowly in heart, and you will find rest for your souls. We have come to feast upon God’s provision and to remember the price that was paid and the love that was displayed for us by Christ on the cross. If you have put your faith and hope in Christ alone I invite you to take the bread and the cup and join us as we celebrate Jesus’ victory this morning. The bread is a reminder of His body that was broken for us. The wine (purple cups) or juice (clear cups) is a reminder of His blood that was poured out to wash away our sin. If you are not a believer in Christ I would ask that you let these things pass by you. But please understand that what we are doing is we are declaring that Jesus Christ is the Son of God as well as our Savior and Lord. We are declaring that our Jesus’ sacrifice is the only thing that can cleanse us of sin and make us right with God. Thomas Watson, A Body of Divinity (Banner of Truth) pgs. 196-198.